With the new free WSCAD Augmented Reality App, you can use the camera of your mobile device (tablet or smartphone) to scan the QR codes of the components within a cabinet. 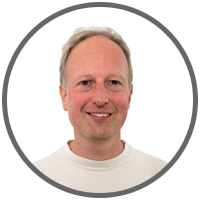 The metadata, 3D models, and PDF schematics of the project must be stored in cloud storage. The QR codes of the components are created in the WSCAD SUITE via the label output (see last section of this Quick Start Guide). The WSCAD AR App is part of the new WSCAD SUITE 2018. It can be downloaded for free from the Apple App Store for iOS operating systems and from Google Play for Android operating systems. Important: This Guide is written for iOS operating Systems. First, you will need to download the WSCAD AR APP from the Apple Store (for iOS operating systems) or the Google Play Store (for Android operating systems) to your mobile device (smartphone or tablet). 1. In your web browser, open the website of the desired app store. 2. Search for “wscad ar” in the app store. 3. Download and install the WSCAD AR App on your mobile device. To get the full functionality of the WSCAD AR APP, you need a Dropbox or OneDrive account. If you do not have an account with one of the two cloud providers, please register there. First install the cloud software on the PC running WSCAD, and then the cloud app on your mobile device. The connection to one of the two cloud providers is entered in the WSCAD AR APP. After the project data has been exported to the cloud storage using the WSCAD SUITE, you can use the WSCAD AR App to load the projects in the cloud storage onto the mobile device. Dropbox’s basic offering with 2GB of storage is free. You will need to register and download an installer. The Dropbox folder can be found under “C:\Users\<user>\Dropbox”. In addition, install the Dropbox app on your mobile device. OneDrive is already preinstalled on Windows 10. You just need to go to OneDrive from the Windows Start menu and create a new user account with OneDrive. For Windows 7, you can register for free via the link https://onedrive.live.com/about/de-de/ and then download the installation software. The OneDrive folder can be found under “C:\Users\<user>\OneDrive”. In addition, install the OneDrive app on your mobile device. In the WSCAD SUITE, you can save the metadata of the used components (reference designation = ref. name, function text, part number, manufacturer) for the open project locally or directly in a cloud storage (e.g., DropBox or Microsoft OneDrive) in a wsAR file. The file also includes a PDF file with all schematic pages and the 3D models, if desired. The metadata for the component (reference designation = ref. name, function text, part number, manufacturer) is displayed in the WSCAD AR App in the information area. To be able to save directly to a cloud folder, you must have registered with a cloud provider. Prerequisite: The project is open in the WSCAD SUITE. 1. 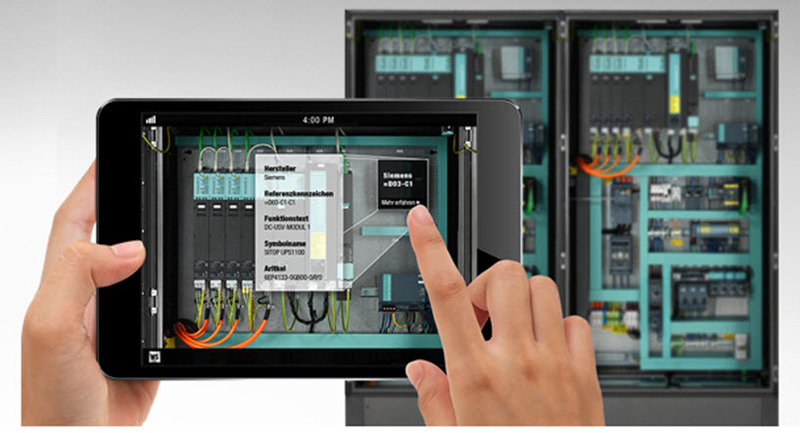 Click in the WSCAD SUITE on the menu command Project | Export | Augmented Reality App. a. If you want to save the file locally or on a network drive, select the radio button Local. Use the Browse symbol button to select the directory and assign a name to the wsAR file. Note: The file must then be copied to the cloud folder. b. If you want to save the file in a cloud folder, activate the radio button of the installed cloud provider (e.g., OneDrive or Dropbox). Note: The cloud service radio buttons are visible only if the cloud service has been installed. 3. If you have assigned 3D models to your parts and you want to display them three-dimensionally in the WSCAD AR App, select the check box Export 3D models. 4. If you want to display the folder containing the exported files after the export, select the check box Open folder in Explorer. 5. Click Export. A *.wsAR file is created in the selected folder. 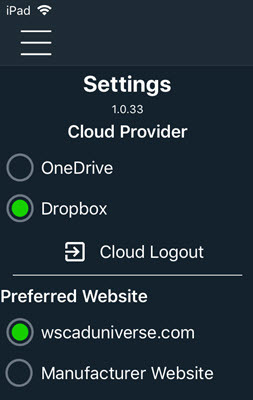 After the WSCAD AR App is installed on your mobile device, you will need log in to the cloud provider the first time the app is started and load the required projects from the cloud storage onto your mobile device. 1. Tap the WSCAD AR App. 2. Confirm the cloud provider message with OK if displayed. 3. Choose your cloud provider under Settings | Cloud Provider. 6. Log into the cloud provider with your user name and password. 7. Confirm the access prompt with Yes. The contents of your cloud folder will be displayed. 9. The projects are displayed in the WSCAD AR App. You can choose to display additional information for a scanned part from wscaduniverse.com or from the manufacturer website. To access the data of wscaduniverse.com, you need to register once for free. 2. Select the desired website under Settings | Preferred Website. If the components within the cabinet are provided with QR codes, you can scan the QR codes and view the information of the selected component. Note: For wscaduniverse.com you need to register once for free. 2. Focus on the cabinet and tap on the desired, recognized QR code. Note: Detected QR codes are gray, unrecognized QR codes are colored red. 3. The available information is displayed at the bottom of the screen in the information area. The 3D model is loaded. You can rotate and zoom in and out of the 3D model. Depending on the setting, the data will be retrieved from wsacduniverse.com or the manufacturer’s site. Note: When you first visit wscsaduniverse.com, you must log in with your user ID. In the PDF presentation, you can save a note with the respective component. Prerequisite: A component is marked in the PDF plan. 2. Enter your comment and close the dialog. The PDF file with your comments will be transferred back to cloud storage. 4. Finally, tap on the project name in the navigation bar. You can choose a different cloud storage. 2. Select your cloud provider under Settings | Cloud Provider. You will be shown the projects available in the cloud storage. If projects have changed in the cloud storage, you can update them in the WSCAD AR App. You can download more projects from the cloud storage to the mobile device. In the WSCAD SUITE, you can generate and print the QR codes for the parts via the label output. You can select and edit predefined label settings or define your own label settings. For the output of labels to a printer, you can define label information and a label template for the QR codes and save them as a label setting. You can print the QR codes via Report | Labels | QR Codes. Details on creating QR code labels can be found in the online help under Reporting | Labels or in the “Creating Labels” blog.